In September of 1965 at the Frankfurt Auto Show, Porsche introduced the Targa variation of the 911, but it took over a year for the first ones to roll off the assembly line. It is not quite clear whether the word Targa is from the Italian translation of "Shield", or if it was named due to Porsche success in the Targa Florio road race. Either way, Porsche marketing liked the linkage. At the time, it was a rather novel approach to open top driving in that it was not simply a cabriolet with the top chopped off a coupe version. It used a roll bar which was a feature confined to race cars. The roll bar was of course a good way to preserve some of the structural rigidity which was always lost when the roof of a coupe was removed. The prior 356 had used a number of reinforcing tricks to achieve the same goal, but the 901 chassis needed extra help. The Targa format was also thought to satisfy impending US department of transportation laws which would ban traditional cabriolets. However, it may just have been fortunate timing for Porsche. Initial press photos showed the roll hoop trimmed with vinyl, but production cars had the hoop finished in a brushed metal look. The soft removable rear window along with a vinyl removable top, came suitably close to a full cabriolet, and with the rear window in place, you had the effect of a large sunroof. The rear window was easily removed by zipper, and covered beneath a tonneau which fatened to snaps. The targa top was easily removed or put back in place with two clamps and two locating pins. The top folded nicely into a form which would easily fit in the trunk. The combination was thought to have provided flexibility and convenience. The Targa model added weight (110 lbs) and cost, but sold so well that production struggled just to keep up with German domestic demand at first. 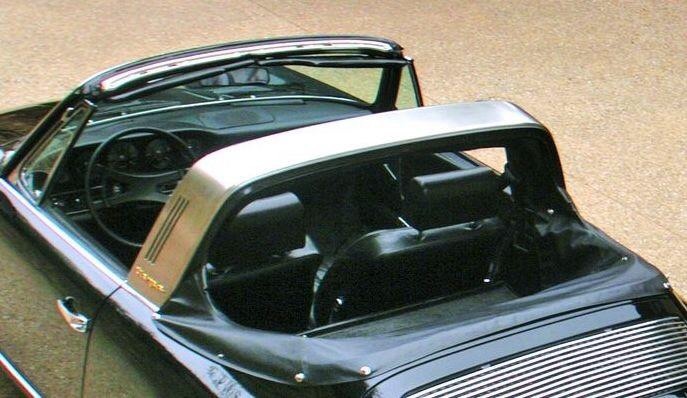 In 1969, a fixed rear window was offered on the Targa, which subsequently became heated. Vertical vents in the roll hoop improved cabin ventilation. With the exception of the S model (as you might expect), the Targa matched or outsold the coupe variation into the 1970s. The word Targa made it into general automotive lingo describing a roll hoop and a removable section of roof.